THEATRICS are as important as the cut and thrust of competition when gladiators stride into the arena. Brutal efficiency isn't enough - showmanship is needed to stand out from the pack. The analogy holds for the Gladiator, Jeep's new four-door, four-wheel drive pick-up. Jeep calls the 5.5m-long vehicle "mid-size". It is about 20cm longer than the vehicles Australians are accustomed to, so it will stand out like the proverbials when parked alongside. 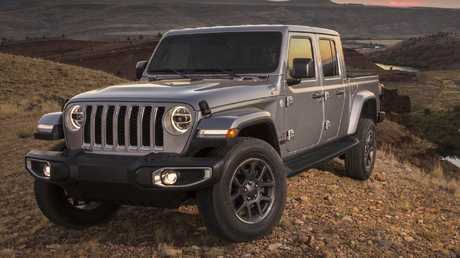 The Gladiator is a late starter in this battle but brings Jeep's unique competencies to the top-selling segment in Australia's new car market. The Jeep Gladiator is about 20cm longer than the average Australian dual-cab ute. The sole engine confirmed for now is Chrysler's 3.6-litre V6, to be paired with an eight-speed automatic. The company's 3.0-litre turbo diesel, with the same transmission, is also a likely starter in our market. Jeep's latest toy has carrying and towing capacity to match the Ford Ranger and Toyota HiLux but is being touted as a purpose-built "lifestyle" vehicle rather than a workhorse turned family transport. That's evidenced by the dirt bike tyre imprint moulded into the front of the bed to help owners quickly align their toys for strapping down on the four tie-down points in the bed. In Rubicon grade, the Gladiator comes standard with front and rear diff locks and electronic sway bar disconnect. In keeping with the lifestyle approach, Jeep deliberately opted for a tough steel tub floor with relatively low alloy sides. The Gladiator should come with either a petrol or turbocharged diesel engine. The rationale for the latter is that buyers wanting to carry dirt, mulch or serious volumes of building supplies will go for a "full-size" pick-up, the Gladiator adopting the role of an all-rounder that isn't as hard to drive around town. The blow that could fell this gladiator is the crash test score. The Wrangler 4WD on which it is based earned a dismal one-star safety rating from EuroNCAP. Jeep global PR boss Ariel Gavilan says the company "won't speculate on safety ratings" but don't hold your breath on the Gladiator doing a whole lot better. That will preclude it from consideration by fleets whose workplace safety policies typically require a top safety score for vehicles. It's likely to have less impact on tradies looking for a weekday workhorse and weekend escape machine. 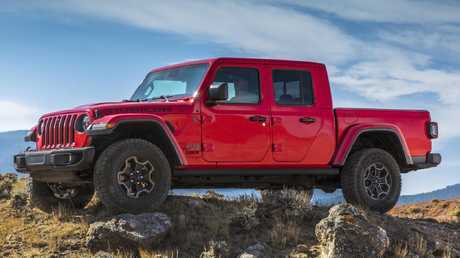 The Jeep Gladiator promises strong off-road ability. The design brief for the Gladiator - Jeep's first ute in 28 years - was to have a 1.5m tub and best-in-class capability off the bitumen, along with the ability to carry a full-size spare underneath (on the Rubicon, the wheel's diameter is 35 inches). As a Wrangler derivative, it also had to have a removable roof, doors and fold-down windscreen. The interior of the Gladiator is basic. 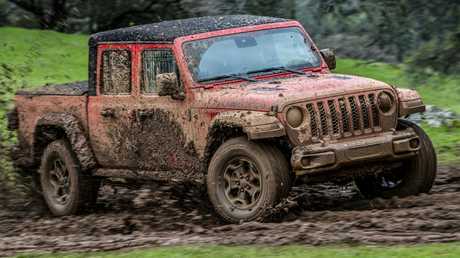 Jeep Australia has yet to confirm variants, specification or pricing ahead of the local launch next year. Based on the US prices, the stickers will start about $55,000 and run up to $80,000. The Gladiator uses a 7.0 or 8.4-inch infotainment screen with smartphone mirroring and, in the case of the Rubicon, new dedicated off-road pages displaying pitch angles and the forward facing "trail camera" that lets drivers see both their steering angle and coming obstacles. First impressions indicate the Gladiator will handle off-road duties with more comfort and control than any pick-up now on the market. We'll learn more when the Gladiator arrives in Australia late next year but for now it's going to cause headaches for everything up to a 70-Series Toyota LandCruiser. The Gladiator has a monstrous turning circle. 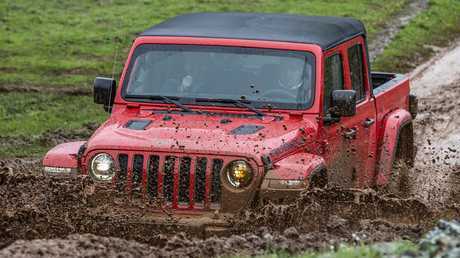 The on-road ride will be a revelation to existing Wrangler owners. The longer wheelbase and rear suspension, adapted from that of the Ram 1500 "full-size" US pick-up, irons out most of the jittery travel that Wrangler owners have learned to live with. The auto hangs on to gears on upshifts under moderate throttle but with a lighter right foot it slips up and down the ratios with little discernible fuss. Wind and road noise suppression is also impressively refined for a vehicle with the frontal styling of a brick, rolling on tall, chunky-treaded tyres. The turning circle isn't tight at 13.7m and the steering is still devoid of much feel but such criticisms apply to all pick-ups. Our Gladiators negotiate a waterlogged and treacherous off-road loop without putting a wheel wrong. That course may have been designed to play to the Jeep's strengths but I'd be hard pressed to think of a vehicle that I'd rather take off the beaten track for its combination of capability and utility. The Gladiator is more comfortable to drive than the Wrangler it is based on. The Rubicon's rock rails soak up huge hits without getting much more damage than scuffed paintwork. Jostling in the interior - even over huge rocks or repeated minor ruts - is suppressed to the point the passenger may not realise just how rough the terrain is. The extra length in the body means it won't handle tight and twisty trails as well as a Wrangler. It's a case of wide corner entry and big applications of steering lock to get around gnarly bends - and that's before you engage the front and/or rear diff locks, blowing out the turning radius even further. As a multi-purpose four-wheel drive ute, the Gladiator takes some beating. It's just a shame the anticipated low NCAP score will cull it from some buyers' lists. 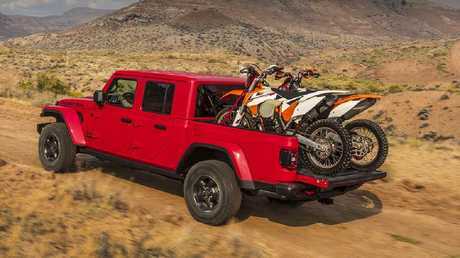 The Jeep Gladiator may not officially be as safe as houses but it's a safe bet this lifestyle pick-up will grab a reasonable chunk of the more adventurous private-buyer market. Jeep North America boss Tim Kuniskis is downplaying the prospect of a two-door Gladiator … but won't officially dismiss it. Standing alongside the two-door J6 concept that will be shown to fans during the annual Moab Easter Jeep Safari in Utah later this month, Kuniskis says building a viable business case would be tough. Jeep’s two-door J6 Gladiator concept. "It is just a concept, like everything else we take to Moab," he says. 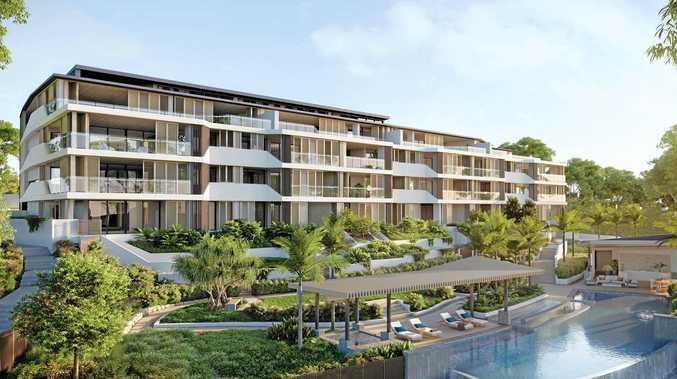 "Now that doesn't mean we're not going to gauge interest in it. "The segment is four-door, five-foot (150cm) bed vehicles. If you slice it down to two-door versions your segment is tiny, so how do you make a business case out of that? But it (the Gladiator) is totally lifestyle, so is it totally different to the segment? Yeah, it probably is." 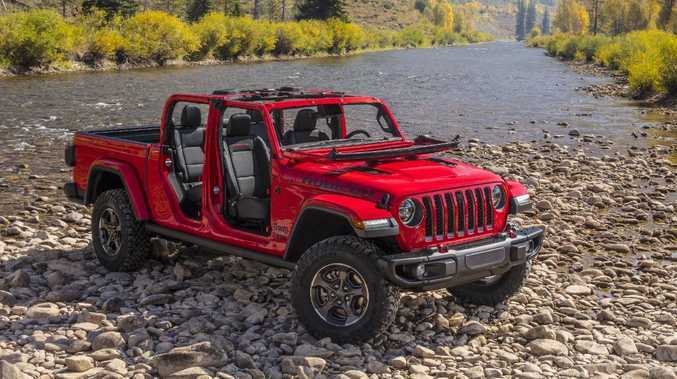 The two-door Wrangler accounts for just 20 per cent of sales, Kuniskis says, citing buyer preference for four-door versions (though Jeep made a case for keeping the two-door when the JL Wrangler launched last year). He was more definitive on not shoe-horning a V8 into the Wrangler and/or Gladiator. "It (the V8) fits like a glove. The problem is, it fits like a glove. The reason that's a problem is you now have no airspace around the engine and the whole external structure of the vehicle so you have no crush space. You have nothing you can use to absorb energy in a crash. "It's not a problem to put it in other than emissions and fuel economy and things like that … except it'll never pass a crash test. "You've got the 2.0-litre turbo with more torque than the 3.6 (V6) and that opens up (performance engine) opportunities for us." Hybrids, he says, have potential for performance versions too. Would hybrids be road-biased or trail-rated? Kuniskis says: "We haven't made any announcement on that yet but trust me, (off-roading is) core to our DNA so we're going to make sure that when we use electrification we're going to use it for an actual benefit, not just for compliance."